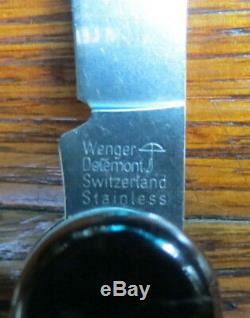 A really nice Wenger Dynasty Gawain Swiss Army Knife number 16631 from the 1980's. 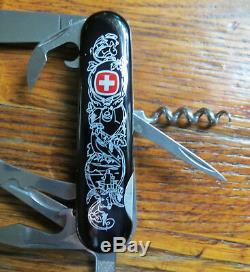 This one features black handles with the Swiss Cross and elaborate decoration. 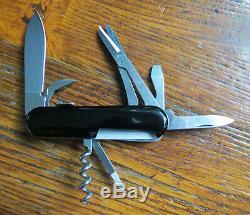 The knife has 7 tools: main locking blade, can opener, screwdriver/bottle opener, scissors, file, punch and corkscrew. 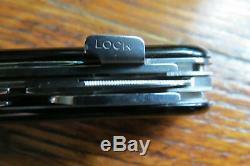 The knife is in mint unused condition. Measures 3 3/8 long closed. 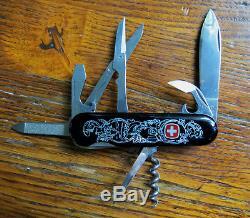 A fine mint condition example of this hard to find Swiss Army Knife. 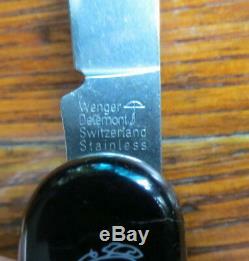 The item "GREAT WENGER DYNASTY GAWAIN SWISS ARMY KNIFE 16631 MINT UNUSED" is in sale since Monday, October 8, 2018.